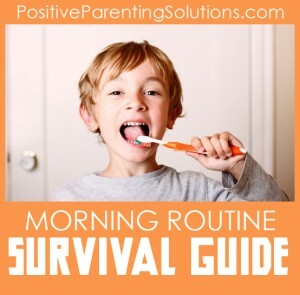 Are morning routines in your house already getting the best of you? A When-Then Routine is a tool to help your kids stay motivated to get everything done in the morning—even the “yucky” stuff like brushing teeth and getting dressed. It structures your morning so that all the not-so-fun tasks are completed before the most desirable part of the morning like breakfast (or morning playtime, TV time, etc.). If your kids show up to the table in pajamas with their hair a mess, you can smile and calmly say, “When everything in your morning routine is finished, then we’ll have breakfast.” Then simply walk away so you’re not available for whining or negotiating. The second component of a successful When-Then morning routine is putting your child in charge of the routine – make it her job, not yours, to get through the schedule on time. Give your child a checklist (in pictures or words) on a clipboard and let her manage her own tasks. Kids as young as 4-years-old can wake themselves up with an alarm clock and complete the routine on their own. Remember, your When-Then Routine is structured in a way to motivate your little one to get the yucky stuff done. If she dawdles through the morning routine, she may not have time for breakfast, playtime or TV time. Don’t worry, your child won’t starve to death if she misses breakfast, but rest assured she’ll be motivated to get through the routine quickly the next morning. Putting your child in charge of the routine without nagging, reminding and yelling from you will yield much better results and give her a sense of independence and accomplishment.